Home PG NEET PG Result 2019- Announced Check Now! NEET PG Result 2019- Announced Check Now! National Board of Examinations (NBE) announced the NEET PG Result 2019 today (31st January 2019). The Result was announced at 17:05 pm online. Now, candidates are waiting for the State Merit Lists for PG Admission 2019. Earlier, the result was about to get released at 16:00 pm but due to some reasons, the result declaration was delayed. The authority will not inform the applicants via email-id or SMS. Link to download the NEET PG 2019 scorecard is provided here. With the scorecard, candidates will obtain information about their All India Rank, NEET PG score, and percentile score. The NEET PG 2019 online (CBT) mode was conducted on 6th January 2019. To get the detailed information related to NEET PG result, how to download, the content of result and highlights – Read Below. As per the latest news, Madhya Pradesh, Odisha, and Kerala have released their respective NEET PG Merit List 2019. The NEET PG 2019 Counselling has been started from 15th March 2019 onwards. The NEET PG 2019 is provided in the table below. NEET PG 2019 result will be released on 6th January 2019. How to check and download the NEET PG Result 2019? 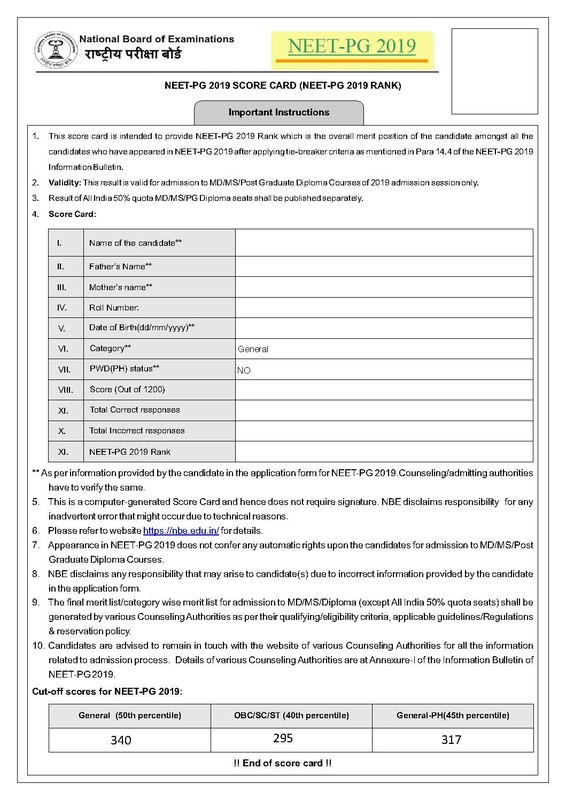 Candidates, those who took the NEET PG Result 2019 must follow the below steps to download the NEET PG 2019 Scorecard. Click on the link “NEET PG 2019 Result” here. Enter your valid NEET PG 2019 roll number, date of birth, captcha code. After entering login credentials, click on the “submit” button. 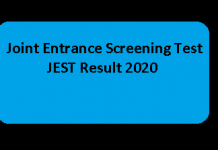 NEET PG 2019 scorecard will be displayed on the screen. Save, download and take the printout of the NEET PG 2019 Result for future use. So, now we have provided a sample of NEET Post Graduate Scorecard/Rank card 2019. Candidates can check what all details are available on the Scorecard of NEET PG 2019 here. NEET PG Result carries the below-mentioned details. Candidates are advised to check the details carefully. National Board of Examinations (NBE), the official authority, will be releasing individual scorecard and rank card for the NEET PG 2019 appeared candidates. In the 2nd week of february 2019, NBE is likely to declare the rank card. Candidates will be allotted different rank as per their eligibility and category which will be displayed on the NEET PG rank card. 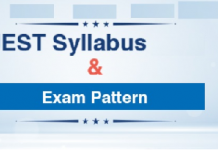 In case of two or more candidates obtain the same marks, then ranks will be allotted by using tie-breaker criteria. Applicants can check a different kind of ranks given below. 1. All India Rank (AIR) NEET PG 2019 This rank is the overall merit position of a candidate amongst all the candidates who will take NEET PG 2019. 2. All India 50% Quota (AIQ) Rank This rank represents overall merit position of a candidate amongst all the candidates who will appear for NEET PG 2019 and are eligible for All India (50%) Quota seats. This rank will be considered for admissions to AIQ seats. 3. All India 50% Quota (AIQ) Category Rank This rank will be the overall merit position of a candidate belonging to a particular category (SC/ST/OBC), amongst all the candidates in that category who are eligible for All India (50%) Quota. This rank will be considered for admissions to AIQ reserved seats. NEET PG 2019 marks will be valid for admission for that particular year in which the exam is conducted .i.e it will be valid for 2019-20 academic year only. The marks will not be valid for admission in the year 2020. MS/PG Diploma Courses in government medical institutions. It must be noted that NBE does not provide facility to candidates to apply for revaluation or rechecking of the responses submitted in the exam. The marks obtained in NEET PG 2019 will be deemed final. NEET PG 2019 will be conducted 6th January 2019 in online mode nationwide. Qualified candidates get admission to various prestigious medical universities in India. This year, around 1,48,713 candidates had registered for the exam, out of which 1,43,148 candidates have appeared the exam. Hence, this year’s NEET 2019 Result Statistics as published by the National Board of Examinations. Thus, these are registered and the appeared candidates stats for NEET 2019 Post Graduate Result 2019. What After NEET PG/MDS Result 2019? Scanned Full Signature used during PG Registration. Thus, if you have any issues or doubts regarding the NEET PG 2019 Result, then comment on the section below. 3 How to check and download the NEET PG Result 2019? 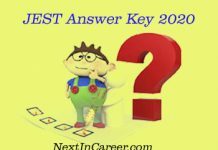 13 What After NEET PG/MDS Result 2019?